The competition aims to encourage young people to use their writing skills and to write with imagination and creativity. It is open all schools and college communities including those that are home educated and any other young people’s community organisations, for example, community RotaKids, community Interact, Scout Groups, Girl Guides. The task for the 2016/2017 year is to produce a written or typed story in prose entitled, ‘Reflection’. The written entry could be fiction or non-fiction, a story or a poem, as long as the piece relates to the theme. Questions have been asked about spelling and although this is not an issue the only advice to be given are that judges of this competition have made comment upon spelling in the past. 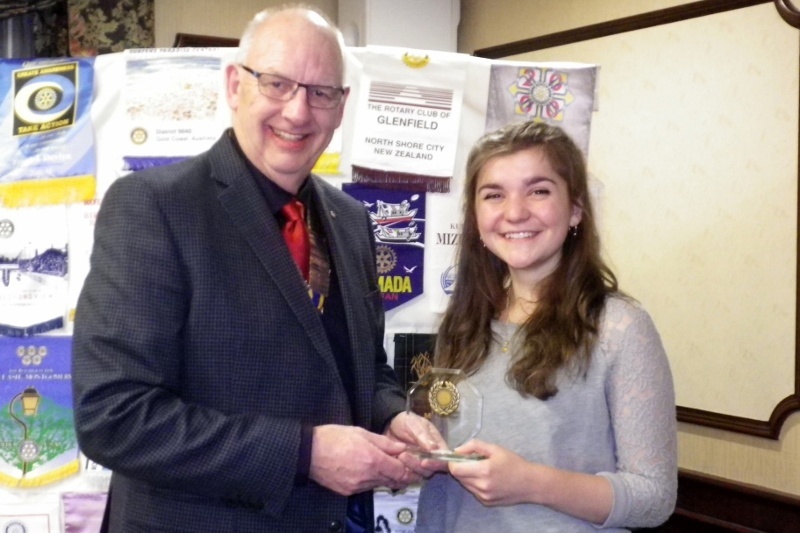 The winning entry in the local competition organised by the Rotary Club of Swindon North was submitted by Isobel Maxwell, age 17 (seen here receiving her prize from Rotary Club President David Collett). He holds it in his hands. He stares at it – into it – for the longest time. A seemingly innocuous ring, the colour of October leaves, delicate and cold. It looks out of place, cradled in his sausage-like fingers. He notices his reflections in it, bastardised, features twisting and melting into some monster that would be more at home between a Dali and a Munch than a living room in Bradford. But still he stares, until his vision blurs. He stares until his face becomes quite unfamiliar; he stares until his disfigured face softens into something he can stand to look at. A clock in the hall tolls the hour but he pays no attention. It is as if he were beyond that, now, as if it no longer mattered. He has nowhere to be; he has no one to care where he is anymore. He twists the ring in between his fingers, feeling it more than looking at it now. It slips neatly onto the first section of a forefinger, then steadfastly refuses to move. There is a flutter of panic in his chest as he rips at it, forcing it off. It comes too quickly, slipping away from him with a small pop, leaping, for a long moment suspended airborne, then vanishing into a metallic chime against the oak floor. It disappears under the sofa. He stops for a moment, startled, as sometimes children or small animals are. He feels a pang of something familiar in his chest – something like disappointment, something like the ache you feel when the dreadfully inevitable occurs. He should have known better. His knees strain as he lowers himself to the floor, squinting into the abandoned twilight underworld of the sofa. The ring glints, winking at him; he sticks an arm in and grasps at it, but it remains out of his reach. And he remains stuck there, shoulder jammed between floor and sofa, rear in the air, trousers straining awkwardly over skyward buttocks. Pathetic. She would have laughed at him – she was always laughing at him, with that silvery laugh. He pretended to like it, but it always seemed just a little too metallic, a little too robotic. It would send shivers down his spine, but he longed to hear it, all the same. The alternative was that dull silence, the soundlessness of dead hope. He had thought, once, that she had loved the ring; it was everything he wasn’t. It was everything he admired in her. But when it came to it, she had left that too. The floorboards inches from his nose are covered with an unaccustomed drift of dust, like the first spring frost. She would have hated that – she would have screamed at him. He listens to the silence of the room and finds it changed; instead of hearing the noiseless aftermath of insults, he hears the hum of the radiator, the television. The birds outside. He traces the outline of a daisy with his fingertips and grins. There are 3 age groups, 7 to 10 years old, 11 to 13, and 14 to 17 years of age on 31 August 2016.